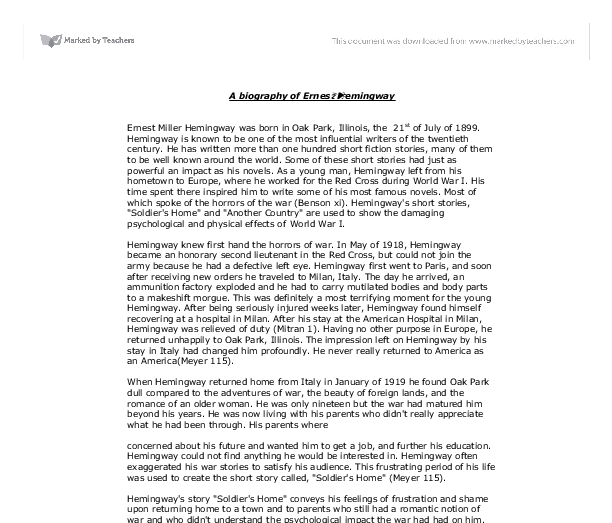 A biography of Ernest Hemingway Ernest Miller Hemingway was born in Oak Park, Illinois, the 21st of July of 1899. Hemingway is known to be one of the most influential writers of the twentieth century. He has written more than one hundred short fiction stories, many of them to be well known around the world. Some of these short stories had just as powerful an impact as his novels. As a young man, Hemingway left from his hometown to Europe, where he worked for the Red Cross during World War I. His time spent there inspired him to write some of his most famous novels. Most of which spoke of the horrors of the war (Benson xi). Hemingway's short stories, "Soldier's Home" and "Another Country" are used to show the damaging psychological and physical effects of World War I. Hemingway knew first hand the horrors of war. In May of 1918, Hemingway became an honorary second lieutenant in the Red Cross, but could not join the army because he had a defective left eye. Hemingway first went to Paris, and soon after receiving new orders he traveled to Milan, Italy. The day he arrived, an ammunition factory exploded and he had to carry mutilated bodies and body parts to a makeshift morgue. ...read more. The Marines had taught Krebs that no man needs a woman. They taught him that women involve too much work and only cause problems. Trying to obtain a relationship involved to many consequences. It wouldn't be worth going through the pain of heartbreak or rejection. He would sit on his porch, and watch women walk by. He admired their clothing, their hair, and they way they walked. He wanted a girl, but didn't want to work for one. He didn't want to go through having the stress and pressure when trying to get a girl. "He did not want any consequences." (Hemingway 117) The only one who treated him like a hero was his little sister. Krebs faith in religion was also effected. It seemed like all his faith faded after the war. His mother explains to Krebs that, "God has some work for everyone to do. There cant be no idle hands in his Kingdom." Kreb replies, "I'm not in his Kingdom." (Hemingway 119) He seemed to have lost his emotions totally. Even as his mother tells him that she prays for him every day, he is too busy looking "at the bacon fat hardening on his plate." ...read more. These men aren't even able to go back home because of their injuries. (Hemingway 210) War can destroy and sometimes end a person's life. 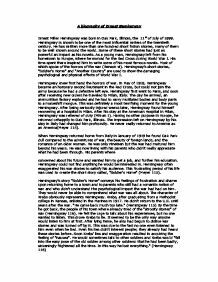 Hemingway's short stories, "Soldier's Home" and "Another Country" are used to show the damaging psychological and physical effects of World War I. Hemingway is able to explain these affects of war to his readers most effectively. This is because of his firsthand experience in his involvement in World War I. He had been exposed to the horrors of war himself. In the story "Soldier's Home" a man who represents Hemingway comes home from World War I much to late. No one appreciated what he had done for his country and was forever psychologically damaged. He came home as a totally different person and now couldn't lead a normal life. He didn't have the will to work or obtain an education. The American soldier's in "Another Country" where forever damaged by the war. Each of these men couldn't even leave Europe because of their injuries. These men can never return home and pick up from where they left off. Their injuries will hold them all back from doing the things they love most. One mans injuries held him back from being with his sick wife back at home. These two short stories are perfect examples of how war can change a man's life forever. ...read more. In Krebs's community, along with much of the nation, the information from the war was mainly dulled to prevent backlash against the government, and no one truly knew the horror of war except for those who served. Hemingway most likely added this detail to the story to emphasize the wide variety of exposure levels to combat. George, on the other hand, recognizes that evil exists but decides to send someone else, in this case Nick, to deal with it. George is indifferent to the situation and is ultimately not affected by it. He states, "That's what they kill them for." Eventually, the two discuss an operation, which the man earnestly reassures her is "awfully simple . . . not really an operation at all . . . all perfectly natural" (726). The woman is unconvinced, questioning "what will we do afterward," but says she will have the operation because "I don't care about me" (727). Lions are dignified, and in certain African societies, it is thought that a lion is a king, and a king is a lion therefore making the two beings one entity (McCall, 1973/1974, p. 134). North American cave paintings portray lions as deities. Additionally, friends of Jake realize that he releases his sadness and frustration regarding his wound through the consumption of alcohol. Jake's friend Bill Gorton tells the hero, "...You drink yourself to death" (Hemingway 109). Bill is able to see the reason for Jake's incessant drinking; that it has become a means of release for the wounded hero. She doesn't want him to say he wants to break up with her because she doesn't feel that way - she doesn't want to break up with him. Nick knows that it is getting to her so it is urging him to say more because this is his chance to finally tell Marjorie how he feels. He wishes to tell the truth behind the engagements he fought in, while they bask in the glory of their fictional, tales of war, and "detailed accounts of German women found chained to machine guns in the Argonne Forest (Time 70)."